The adverse effects of vibration, shock and noise disturbances range from simple annoyances to shortened equipment life, and can negatively affect performance, reliability, comfort and safety of your equipment. 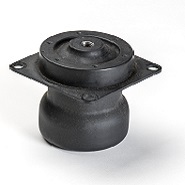 Our customizable portfolio of LORD Elastomeric Mounts and Bushings provide simple, reliable and cost-effective solutions to isolate vibration and shock, accommodate motion, and decrease noise. Vibration isolators, properly applied, will improve your products. They will operate more smoothly and quietly, and they will be less disturbing to surrounding equipment and personnel, less susceptible to damage and less expensive to make. Elastomeric vibration isolators provide cost-effective solutions to problems involving vibration, shock and structural noise control. 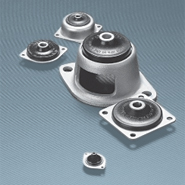 LORD Corporation vibration isolators set the standard for compact, high-load, high-capacity anti-vibration mounts. 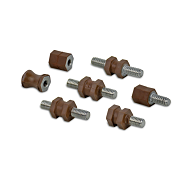 They are designed to support and protect equipment in all types of industrial applications. 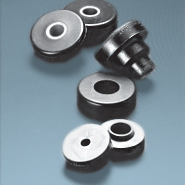 LORD offers many standard products to meet most applications as well as custom-designed vibration isolators or a combination of LORD products. LORD Corporation's vibration and noise control experts can analyze your individual requirements and provide the most effective and affordable product solutions. To learn more, view our products listed below or download our Industrial Parts Catalog. The theory and concepts for elastomeric vibration isolators are relatively straightforward. A great many of the applications are uncomplicated, and the non-specialist can handle them directly. However, some vibration and shock control problems are quite complex, making component selection and design complicated. These more complex applications require the involvement of specialist in order to arrive at suitable recommendations and LORD has a technical staff available to assist you. Learn more about Vibration, Shock, and Motion Control. Machinery Mounts are designed to support heavy equipment and isolate intermittent or continuous vibration. The result is greater machine accuracy, longer service life, smoother operation and reduced maintenance. 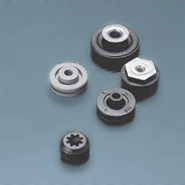 Center-Bonded Mounts isolate vibration, control shock and reduce noise due to structure borne vibrations. Available in a full range of rated load capacities and able to withstand shock loads of 10 g’s, these mounts effectively protect equipment and improve operator comfort. 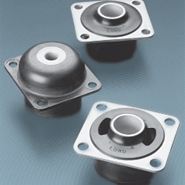 Conical Mounts provide effective vibration isolation and noise attenuation with a simple, robust mount design. Consistent performance, high load bearing capabilities and a choice of radial stiffness characteristics are key features of these mounts. 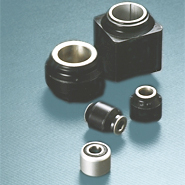 Bushings (Center-Bonded and Square-Bonded) are used in applications where the absorption shock, attenuation of noise, reduction of wear and elimination of lubrication is required. 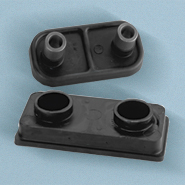 Surface-Effect Mounts combine surface-effect damping principles with traditional rubber-bonded-to-metal technology. The result is a soft mount capable of providing effective damping over large deflections and a wide range of frequencies. 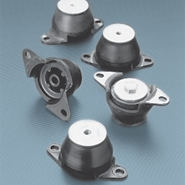 Binocular/Split Mounts are designed for applications involving severe dynamic forces in the static load direction, as well as the rebound direction. Travel is limited in both directions by rubber in compression that provides snubbing. FluidlasticTM Mounts combine rubber and fluids to provide vibration isolation and noise reduction measurably better than conventional mounts. They also provide greater versatility because the mounts are tuned to precisely match application requirements. 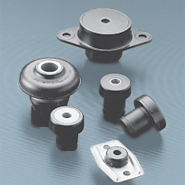 J-20922 Series Mounts are especially designed for mounting 2-, 3- and 4-cylinder gas or diesel engines in various types of vehicles and equipment. 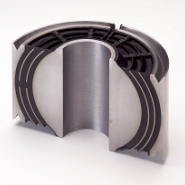 High Capacity Laminate (HCL) elastomeric bearings not only provide superior vibration control in a variety of off-highway equipment, but they also lower the equipment’s operating costs. Micro-MountsTM are high-performance isolators small enough and soft enough to protect individual electronic components allowing isolation at the circuit board level. Micro-Mounts can be used as a stand-alone solution or to augment performance of a LORD full-system isolation solution. 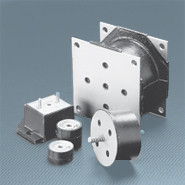 Plateform Mounts provide effective isolation against vibration. The contour of the flexing element was developed to provide uniform stress distribution. This, plus high strength bonding and the use of specially compounded elastomers, provides maximum service life. 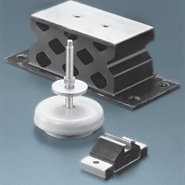 Grommet Isolators provide effective, economical vibration isolation for light loads. They are suitable for commercial and military applications including computers, disk drives, business machines, precision instrumentation and general industrial equipment. 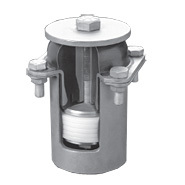 Flex-BoltTM Sandwich Mounts are constructed with high-strength bonds and specially compounded elastomers; providing excellent capacity for energy control, high load-carrying capacity, and long life. Two-Piece Mounts are designed for applications involving severe dynamic forces in the static load direction, as well as the rebound direction. Travel is limited in both directions by rubber in compression that provides snubbing.